Update 2: Just found out the latest Macross Frontier news that the movie will be in two parts. The first to be shown on Nov 21, 2009 will be a retelling of the series. The second movie will be a new plot altogther... Woohoo Fan Service!... Arigatou Gozaimashita Kawamori-sama! Update: Found a Macross Frontier Movie Trailer here. Guess its going to be a re-make after all. I have to admit that I'm on the edge of my seat waiting for any news or spoilers with regards to the announced Macross Frontier Feature Film that was announced at the end of the series last year. The latest news I heard is that the movie will be released in the fall of 2009. During the launch celebration of Macross SDF1 early this year, character actress Megumi Nakajima(Ranka Lee) performed her new song "Sō Da Yo" for the movie. Also featured during the celebration was some animation on Sheryl Nome's new concert hall to be used in the film. The Macross F cast also performed an audio recording of a promotional video for the film. Shoji Kawamori, series creator, and the other voice actors have kept mum on the details. Not even a sliver of the plot came out of their mouths. The last thing that Kawamori was alleged to have said was that the delay is in the animation creators. So does this mean that the story has already been finished and no more changes will be made? maybe? There had been a lot of speculation by fans on the web as to what the plot of the movie will be. Some rumors I've heard was that the Movie will not center on Alto, Sheryl and Ranka but on some other characters. On my part, I wish it wouldn't be a shortened and summarized version of the series similar to Macross - Do You Remember Love or Macross Plus Movie edition. That would really blow because as a fan I'd really want 100% of the movie to be something new and not one part of the series plot to be revised. I wouldn't want to have any loose ends also after watching the movie. 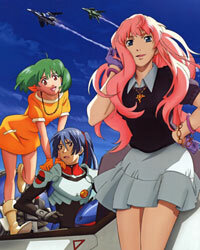 More specifically I'd want the love triangle between Alto Saotome, Sheryl Nome and Ranka Lee resolved. Not like how Shoji Kawamori left us hanging as to who Mylene ended up with in Macross 7. That's one Macross series characteristic I wouldn't want repeated. Personally I'd prefer Alto end up with Sheryl because they look better together and Sheryl deserves to be happy after the rough childhood she had. I hope too that it wouldn't have a lame plot as Macross 7 Dynamite. My jaw still drops whenever I think of that movie. Then again the entire Macross 7 franchise had weirded me out. The few reasons I watched it was because I wanted to find out what happened to Max and Milia, as well as the history of the protodevlin and the protoculture and primarily because Kawamori was behind it so it had to be taken as canon.